Dear traders and crypto enthusiasts! As promised, we didn’t want to make you wait long for the 2nd season of p2pb2b Referral Games. The next round of our program starts on February 1st and will last until February 28th. This time there won’t be that much time so hurry up to participate! For pacing the KYC procedure you get 10 points. Users will also get 15% of each trading commission paid by the referral for transactions made in Bitcoin Rhodium (minimum deposit = 10$). The prize will be distributed between the participants in accordance with the number of points. Only 1st and 2nd referrals are considered. 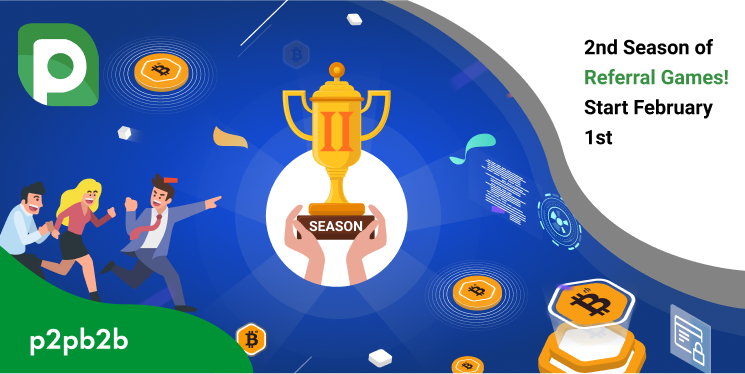 Follow to the official page of p2pb2b Referral Games on February 1st and participate!